Well, we all have witnessed the changing market dynamics and financial hiccups in the past, especially during the post-recessionary period. We all agree that financial security is very important to sustain in today’s world. But how many of us are actually working towards it? Gen Ys…Knock knock! Even 5 years down the line, we are still ‘THINKING’ about investment and security. However, thinking without actions has Zero value. With wobbling global economic scenario, the focus on financial security will continue to increase. Our youth ought to understand this. There is no choice! Remember, YOU are accountable for your financial health. Today, youngsters are thinking about building their own personal brand. They want a high social status and a high standard of living. They are really struggling very hard to meet their life goals. And I really admire their hunger to outperform. After all, if you want to grow and prosper in your life all these things are absolutely critical. But wait a second….take a pause and think for a moment! Is spending your entire income in managing your today by ignoring your tomorrow a smart move? Once you are convinced that there is no substitute to investments and securities you will start exploring the options. At times, you will get bogged down by the breadth of options available in the market. Relax, this happens to everyone. In order to ensure that you understand the financial undercurrents, seek help from experts. These experts can be your friends, colleagues, financial advisors, relatives or even your well-wishers. Just make your first move. Don’t hesitate! While there are a number of options available in the market, it is important that you purposefully engage your money by diversifying your portfolio. Accordingly to me, your portfolio should resemble a pyramid. While it is important to make the base strong, you simply cannot build your house without a roof top. 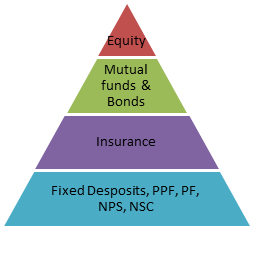 It is important to diversify your portfolio in the right proportion at the right point of time across the pyramid. With fluctuating economic scenario, it has increasingly become important to keep an eye on changing “money market”. Keep screening the market continuously to tap the opportunities and tackle the challenges. You need to track your every single move as even one mistake can cost you a huge penalty. Beware! *Insurance is not an investment. This entry was posted in Investments. The state of a bright young hire in any organization is analogous to that of a newly wedded bride in any Indian family. It is always a give and take relationship and to make it successful one must understand rules of the game. While the bride expects love and care from her in laws, she has to prove her self- worth in order to gain confidence of her beloved ones. Remember that YOU are a new member in the family hence it is absolutely essential for you to understand how the system works. While the organization is always there to extend its support, you need to make an extra effort to align yourself to the existing ways of working. Create a vision and work very hard towards it. There is absolutely no substitute for hard work. Your positive approach and extraordinary energy levels will definitely help you to achieve your goals in life. Persistence is the key to success! Every organization has its own DNA. You might come across people from various generations, with diverse backgrounds, and from different cultures. Hence it is very critical for you to adopt different ways of bonding with people. To connect with your stakeholders, understand the business thoroughly and know your people well. Speaking the same language will help you to build long term relationships with your stakeholders. Finally, belive in yourself, leverage on your strengths, and work on your improvement areas. You will definitely succeed in your life. A whooping 87% of companies are losing their Gen Y workers says Heather Huhman. Don’t monitor them all the time. Members of this group will deliver great results if you allow them to decide and act on their OWN action plan. While they love freedom, they are mature enough to know their responsibilities and their deliverables. Treat them like adults! These young members are full of positive energy. You need to channelize their energy in the right direction to boost overall performance of the organization. This generation has witnessed luxurious lifestyle. Hence money alone can no longer motivate them to stay with any organization. Companies need to create a learning ecosystem that can provide 360 development opportunities to members of this group. Provide them variety of career experience and help them blossom in their life. They will definitely do wonders to your organization and the community as a whole. If you wish to retain your top young talent, have these open conversations with them on regular basis. They are open to feedback and value honest opinions. Regular discussions with them will help you to know them better and to retain them as well.